The other weekend Ben and I took Luna to the Desert Botanical Garden here in Phoenix and we had such a blast wandering through the gardens marveling at the some-50,000 different desert plants. It's a great place to take your kids and stroll. Not only is it vibrant, beautiful and a fun weekend activity, but it's a great place to get a little outdoor exercise by walking through the five beautiful Sonoran Desert trails. I love to visit the Phoenix Desert Botanical Garden in the spring, fall and winter (aka the cooler months in Arizona) and I prefer visiting first thing in the morning (they open at 8 am October through April). It's a little cooler in the mornings and also a little less crowded. 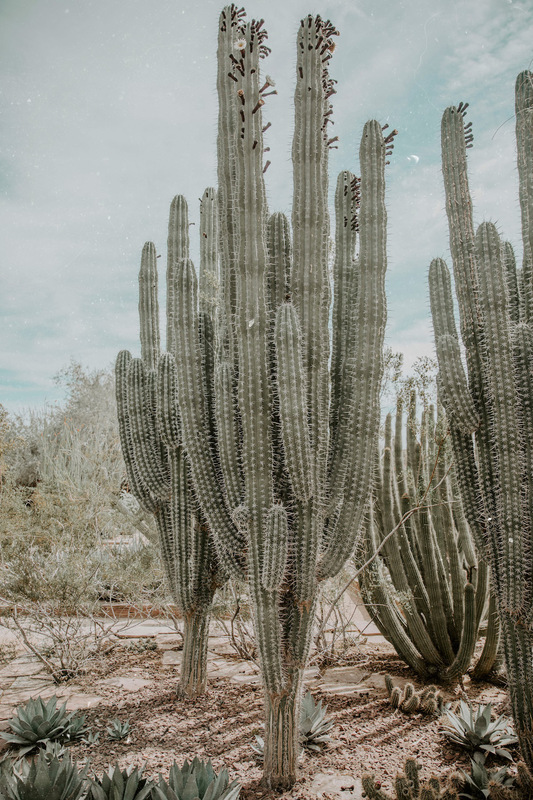 We usually spend anywhere from two to three hours at the Desert Botanical Garden, which I think is a good amount of time to enjoy the alluring wildflowers, lush trees, and pretty succulents. Right now until May 13, 2018 you both view bold monumental sculptures by Japanese-American artist Jun Kaneko as well as visit the spring butterfly exhibit at the Desert Botanical Garden to see the painted ladies, zebra longwings and giant swallowtails and it was really fun to experience. Have you guys ever been? Next time you are considering visiting Phoenix, take a look at the Desert Botanical Garden! The Botanic Gardens looks amazing and looks like you guys had a wonderful time! Love your jumpsuit! The perfect jumpsuit to visit a botanic garden! The place is superb and your pictures are as well! Awww, such a fun photos! You are looking charming in this perfectly styled boho and summery outfit!